Home / France / #NoBorders #Gap, France: Call for mobilization! – Solidarity is not a crime! #NoBorders #Gap, France: Call for mobilization! – Solidarity is not a crime! On Thursday the 8th of November the trial of 7 activists from France, Italy and Switzerland will take place in Gap (France). They face penalties of up to 10 years imprisonment and fines of €750.000. They are accused of “gang aiding immigration of foreigners with irregular status on French soil”. This is justified with the participation in the Solidarity March on April 22, 2018. Originally published by Contra Info. Edited machine translation by Enough is Enough. This spontaneous demonstration was a reaction to the racist and dangerous provocations of the far right group “Génération Identitaire”. 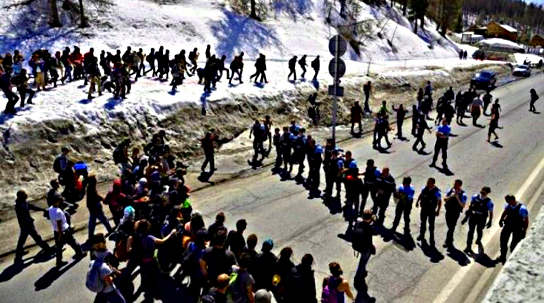 The far right group occupied the “Col de l’Echelle” pass between Italy and France the day before and was completely unchallenged and thus prevented all people on their travel plans. Following the demo, 3 activists were detained for 11 days and then spent another 25 days under house arrest. In this case, on the 6th of July 2018, the Conseil Constitutionnel decided that people who spontaneously / accidentally provide solidarity-based humanitarian aid on French territory to people who crossed borders who riseked their lives remain unpunished. However: All people who provided organized assistance to cross the border should be punished. As a result of this ruling, another 4 people were arrested. The process begins on 8.11.2018 against these 7 people. The charge against this alleged “group” is the escalation of the numerous repression and intimidation attempts, people of the solidarity movement have suffered in recent months. Increased use of force in the area of ​​migration affects all people who are active in solidarity structures. However, the main victims of this violence are people in exile who are subject to captivity and legal issues related to their residence permits. Discrimination based on appearance / skin color, allegations of theft, violent attacks, threats of firearms and intimidation are part of their everyday life. The present devastating situation at the border also leads us to take a critical look at the shortcomings of this capitalist society: the history of slavery and colonialism, plunder of resources, climate change, corruption, imperialist wars, etc. are the cornerstones of this society, under whose consequences tens of thousands of refugees have to suffer. In addition, to support the 7 defendants, we also call for solidarity with the perpetually dehumanized and criminalized people in exile. We accuse the violence and the social mechanisms of which they are daily affected. For a more welcoming world for everyone! We are calling for a support rally on November 8 in Gap Court. We look forward to decentralized actions everywhere in advance and during the trial! Borders are a myth. It is up to us to blow them up. A resistance and solidarity without borders!